Welcome to Les Châtaigniers in Morbihan, Brittany, a former farmhouse built of local stone (with barn attached), set in one and half acres of grounds with a swimming pool. The house sleeps seven people comfortably in two double bedrooms and one large attic room, and offers roomy, light, accommodation in a peaceful garden setting. The house was built in 1950 and has been refurbished in keeping with its original character. Tenants have exclusive use of the property. 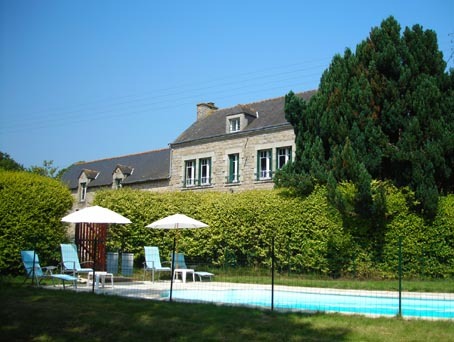 Situated in the countryside in a hamlet near Baud it can be reached in a reasonable drive from the Channel ports; approximately two hours from St Malo and Roscoff, three and a half hours drive from Cherbourg and Caen, four hours drive from from Le Havre. The nearest airport with direct flights from UK is Rennes (approx 1 hour's drive) - Flybe operate services from Southampton and Exeter. The airport at Brest is approx 2 hours away - direct flights from UK with Flybe, Ryan Air and Easyjet. Les Châtaigniers provides a central holiday location from which many parts of the Department of Morbihan can be reached easily including the beaches from L'Armor Plage to Guidel Plage (35-40 mins) and a little further away at Carnac and the Quiberon peninsula. Morbihan, as the Southern most department of Brittany, offers the region's best summer holiday weather and sea temperatures. Further details and information can be found by clicking on the links at the top of the page. Please contact the owner regarding availability and booking forms. Rental charges for 2016 £700 per week in May and June, late June early July £850 per week and mid July £1095, late July and August £1295 per week, late August £1095, early September £850 per week, late September £700 per week. Please note this property is also advertised through Chez Nous ref 283022 and Holiday France Direct ref BM 004186 which provides telephone contact details. The owners have been advertising previously through Owners Direct ref 8032123 since April 2008 but have ceased from April 2017.